David Kravitz welcomes strange travelers to his table in Clemency. Photos: Eric Antoniou. 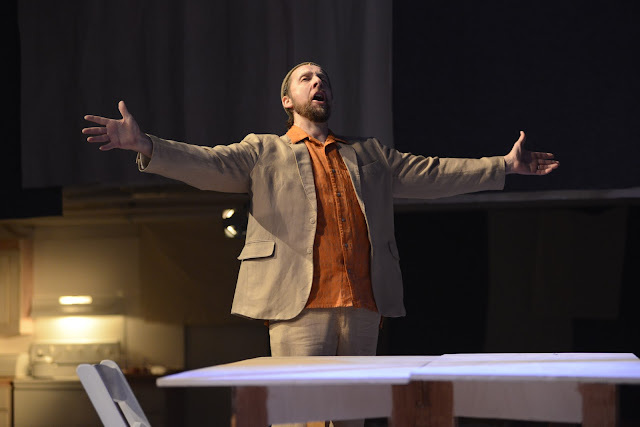 If you haven't been keeping up with Boston Lyric Opera's traveling "Annex" productions, then I'm afraid you've been missing out on the most challenging opera the city has to offer. (Perhaps that it has ever had to offer.) 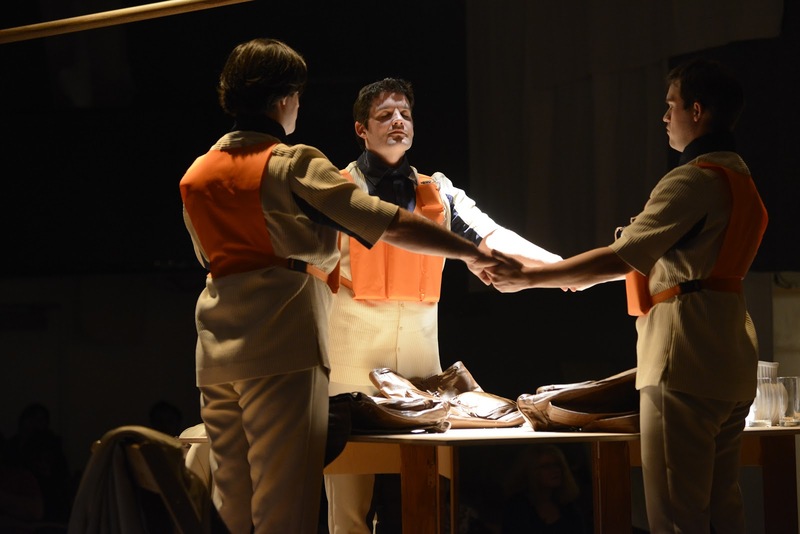 The three previous annex productions - The Turn of the Screw, The Emperor of Atlantis, and The Lighthouse - were all startlingly intelligent renditions of landmark twentieth-century chamber works. And now BLO is offering a brand-new co-commission, Clemency, at the Artists for Humanity Epicenter in South Boston (through Sunday), which I'm stunned to announce belongs in its predecessors' august company. Indeed, something tells me that this brief, haunting piece - by Scottish composer James MacMillan and British poet Michael Symmons Roberts - will eventually earn a reputation as a minor classic of the millennium, and it's exciting to think that Boston has been a part of its genesis. At first glance, Clemency seems conventional enough - it's based on a vignette from the Bible, and its musical style is generally in a late-modern "sacred" idiom. But beneath its deceptively simple surface lies a daring intellectual and political statement, of the kind that perhaps only Tony Kushner or Caryl Churchill of today's playwrights could equal. For MacMillan and Roberts have seized on a strange resonance with the present day in their chosen episode from Genesis, in which the childless Abraham and Sarah are unexpectedly visited by Yahweh himself and two angels, who declare that the barren Sarah will bear a son, Isaac - and thus kick-start the entire Judeo-Christian tradition. But this seemingly joyful story hides a strange sting in its tail: it turns out that Yahweh is just stopping by on his mission to level Sodom and Gomorrah - indeed, the central action of the vignette becomes Abraham's shocked plea for, well, "clemency" for the twin cities of the plain (a plea which, as we all know, is ultimately unsuccessful). So the birth of the Judeo-Christian tradition is unexpectedly bound up with terror, indeed a kind of divine jihad; and when one ponders that Abraham, through his servant Hagar and their illegitimate son Ishmael, is the founding father of the Arab world as well as the Jewish one, one begins to get a sense of the ironic resonances running every which way through Clemency. Indeed, BLO has extrapolated these ramifications by pairing the opera with a staged version of Schubert's "Hagar's Lament" ("Hagars Klage"), which treats the despair of Hagar and Ishmael in the desert (after Sarah expelled them from her home), prior to the appearance of a divinely-ordained spring that spares them from death ("clemency" again - but why?). This double bill lasts only a little more than an hour; but even that short sketch of its opposed narratives gives you some idea of the thematic density of the evening. Which, I have to warn you, BLO has both clarified and doubled in complexity by building a sort of time warp into the production. When Hagar sings to Ishmael, for instance, she is in biblical garb, but Ishmael is in modern dress - we're watching two times at the same place, and the implied correspondence between the ancient destruction of the "twin towns" (in Roberts' phrase) with the modern destruction of the "twin towers" on 9/11 is thus concretized. What's more, we see that this modern Ishmael is being raised by a modern Abraham and Sarah - in Israel? Or New York? It is as if Hagar is crying for mercy after the destruction of Sodom and Gomorrah, but calling to a modern-day Ishmael before the destruction of the World Trade Center. Two time bombs are ticking in Clemency - one for Sodom, and one for us. Indeed, the central - and most shocking - image of the opera comes when Yahweh's avenging angels are revealed to be suicide bombers. There are many I know who will bristle at this notion - as the Globe's Jeremy Eichler did, when he complained that "Hitting an audience over the head with the most glaring symbol of present-day extremism ends up muffling the work's power as an ancient parable with more universal resonance." True, they have something else wound into their DNA, too - Abraham begs for pardon for Sodom and Gomorrah, or at least for pardon if any of the righteous do indeed live there. Indeed, in the end, Clemency is basically a portrait of the age-old conflict between humanism and the stern dictates of religion. Nothing really new there, I suppose - except that perhaps it's difficult for humanists whose government is routinely ordering the killing of civilians by drone to appreciate the irony of their horror of suicide bombers. God's suicide bombers prepare to attack in Clemency. So Clemency is both intellectually and politically challenging in an exciting and daring way - just as contemporary opera should be. The good news is that musically it is also quite strong, and often strikingly good. MacMillan's compositional voice isn't, perhaps, highly original - it sounds most like modernist chant with a Middle Eastern accent; but his structures are muscular, and his use of musical metaphor is consistently powerful and apt. Abraham and Sarah sang in subtly different modes - and Abraham's first aria was set to a text that seemed to be in some sort of pre-language (suggesting that prior to Yahweh's choice of him as a patriarch, Abraham was unknowable and alien to us). MacMillan's writing for the three avenging angels was even more effective - they sang in fierce homophony at first, conveying Yahweh's cold, inhuman purpose; but as Abraham reasoned with them, their musical voice "broke up" into a more polyphonic response - God was now of more than one mind (the libretto somewhat blurs the clear impression in Genesis that one of the three visitors is Yahweh himself). And Sarah had a memorably disturbing aria at the finale - perhaps the most lyrical moment in the opera - in which she pondered a spiritual world in which the price of her pregnancy was the rising smoke of the twin towns (or the twin towers). After all that exegesis, however, I have to admit - the current production isn't perfect; and maybe the libretto itself isn't quite finished (one orchestral interlude was papered over dramatically with projected text). Certainly the solid cast (many of them rising local artists) sang with power and finesse, I'm happy to report - but perhaps almost too much power at times, given the size of the space at the Artists for Humanity Epicenter. In the "pit" (actually a side gallery to the space), conductor David Angus kept a firm grip on the score, and the reliable David Kravitz and Christine Abraham both contributed subtle and moving portrayals of Abraham and Sarah - even as Samuel Levine, Neal Ferreira and David McFerrin brought a scary kind of focus to their trio of angelic vigilantes. But soprano Michelle Trainor perhaps sang with more intensity than variety in the opening "Hagar's Lament" (orchestrated by Angus) which was generally hampered by the fact that the larger conceptualization of the evening was hazy at the start. (Indeed, in its original production in the U.K., Clemency was set clearly and entirely in the present day.) And I also wondered at BLO's reliance on supernumerary players to enact the modern-day Abraham and Sarah - these weren't supernumerary parts; they were roles for professional actors. There was also a noticeable bump in the segue to the opera proper (Schubert ran right into MacMillan), although I understood the intriguing desire to cast the two pieces as one unified meta-opera. I likewise had a few issues with the playing space in general - although I also appreciated the layered metaphors of Julia Noulin-Mérat's design, which conjured the great shade-tree of Abraham's oasis from a cascade of broken planks and falling office furniture - perhaps from the World Trade Center? I couldn't help but wonder; which gives you some idea of the thoughtfulness of this production - you could debate it all night. Which is why I'm simply proud of Boston Lyric Opera at this moment - commissioning a work like Clemency only caps four years of impressive achievement in the Annex series with a memorable original new work. At last we truly have cutting-edge opera in this city - and you only have two more performances of Clemency to be a part of it. And trust me, you want to be there. For I have an inkling that in years to come, plenty of people who couldn't make it will be claiming they were in attendance.